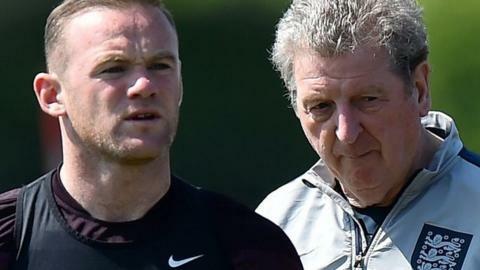 England manager Roy Hodgson has been able to turn his attention to Euro 2016 since qualification was assured with victory in San Marino. Hodgson may have his team for the first group game in France fixed firmly in his mind - but fluctuations of form and fitness may paint a very different picture in June. Captain Wayne Rooney's contribution is once again under the spotlight from a number of people in the media, excluding myself, but by the summer he could well be Manchester United's all-time record goalscorer, as well as England's. What team should Hodgson pick - and who are the England squad members still fighting for a place? Roy Hodgson's simplest choice. Joe Hart is in the world's elite and, while we will see more of Stoke City's excellent Jack Butland in the future, there is no doubt about this position for the Euros. Some serious choices for Hodgson here - complicated by the loss of left-back Luke Shaw, who broke his leg in Manchester United's Champions League loss to PSV Eindhoven. The 20-year-old was in pole position but now the manager must decide whether to go back to the experience of Leighton Baines or look to the younger brigade - Southampton's Ryan Bertrand or Arsenal defender Kieran Gibbs. My pick would be Baines, 31 in December and with 30 caps, unless Shaw makes a full recovery. This is, of course, providing the Everton defender also makes a good return from ankle surgery. Hodgson again has the choice of youth and experience in central defence. Manchester United's Chris Smalling, 25, and Everton player John Stones are fighting for places alongside two men who have captained England in their past two games - Gary Cahill, 29 and with 38 caps, and 33-year-old Phil Jagielka. Stones is simply too good to ignore and it is time for Hodgson to look to the future. The 21-year-old - who Chelsea were prepared to pay in excess of £36m to sign - and the much-improved Smalling is a pairing of rich promise. Hodgson might even consider Stones at right-back but that is a waste of his ability so Liverpool's Nathaniel Clyne should get that spot. Hodgson's plans have again been struck by injury. Arsenal's Jack Wilshere started to stamp his authority on England, both as a holding midfield player in the win in Switzerland then with two magnificent strikes in the 3-2 victory in Slovenia in June. Sadly, he is once again injured and may not be back until Christmas after surgery on a broken leg. Hodgson will be desperate to get him involved as quickly as possible. The manager also needs to decide on a holding midfield player who will allow Wilshere to flourish properly - and perhaps even allow him to trust the maverick brilliance of Everton's Ross Barkley. Michael Carrick will be almost 35 when the Euros start and has 33 caps stretched out over what will be almost 15 years by the time the tournament begins in France. He has also been troubled by injury but, if he is fit and in form for Manchester United, he would represent the best chance of providing a solid base to release the youthful exuberance and ability of Wilshere and Barkley. Some debate surrounds Wayne Rooney, who will be well into his 31st year when the Euros come around - perhaps his last chance to substantiate an England career largely marred by disappointment at major tournaments. For all that, he still adds attitude, ability and leadership so it is hard to see how he can be left out. Flanked by the pace, versatility and movement of Theo Walcott and Raheem Sterling, England's record goalscorer still has the spark to profit from their flexibility by either dropping deep to allow then to move into more central roles or as the point of attack assisted by them. There is no case for excluding Rooney in my opinion. England are still so much better when he plays. Who else could make the starting XI? Hodgson is a manager who trusts experience so there is every chance he may veer away from that more youthful central-defensive partnership of Smalling and Stones to the more battle-hardened players such as Cahill and Jagielka. He is, though, a long-term admirer of Smalling from their days together at Fulham so he has every chance. Hodgson has also talked up the performances of Stones at right-back, a position where he was used in the 2-0 win in Switzerland. This could open the door for one of that experienced pair to partner Smalling, with the odds being on Cahill coming in. Liverpool captain Jordan Henderson is another player well-regarded by Hodgson, not just for his attitude but also his versatility. Indeed, Hodgson preferred him at right-back to Clyne when he substituted Phil Jones after 45 minutes in Slovenia. Henderson, mainly used as a midfielder, is out with a foot injury while another player sidelined, Manchester City's Fabian Delph, has been a regular throughout England's successful campaign. The unsung Delph started six qualifiers - though he tore a hamstring only nine seconds into the win against Switzerland - and was used as a substitute in the 6-0 victory in San Marino, so he will feel he has strong claims. The experienced James Milner, with 57 caps to his name, may also be used when circumstances dictate - while Arsenal's Alex Oxlade-Chamberlain is another who Hodgson has not been afraid to use in big games, as shown when he started him as a teenager in England's opening game of Euro 2012 against France in Donetsk. Hodgson is not short of options in attack but once again it is the curse of injuries that complicate his plans, namely around Liverpool's Daniel Sturridge and Arsenal forward Danny Welbeck. Sturridge was Hodgson's first choice at the 2014 World Cup, scoring against Italy, but has barely played since because of injuries. He is currently on the way back and his mercurial talent may yet win a place if he can be rejuvenated under new Liverpool manager Jurgen Klopp. The most compelling case for inclusion can be made by Welbeck, an unheralded figure but someone who has always delivered for Hodgson and who is a 'go-to man' when fit. For all the questions about the 24-year-old as a natural goalscorer - he has scored only eight in 34 appearances for Arsenal - he has flourished for England, with 14 goals in 33 caps. Welbeck was England's second-top goalscorer in Euro 2016 qualifying with six goals in five games and his tireless work ethic and willingness to do the dirty work on the flanks has made him invaluable and invariably a starter when fit. The problem is he is recuperating from knee surgery and it is not yet certain when he will return. And while all this is to be considered, 22-year-old Tottenham forward Harry Kane has made an impact in qualifying with goals against Lithuania, San Marino and Switzerland. Bertrand's inclusion in Hodgson's latest squad will give the Southampton left-back hope he can spend next summer in France while Tottenham's Kyle Walker and Manchester United defender Phil Jones will also have aspirations of making the trip. If Hodgson wants to utilise his numbers, Walker may need to impress very quickly because Hodgson has also used Jones - albeit with little success - as a right-back and holding midfield player while Stones can also fill that position. It leaves Walker fighting for his place on the plane as Jones is a more natural central defender, giving Hodgson a variety of options should he include him. Swansea City's Jonjo Shelvey has pushed himself into the midfield mix with fine performances while Hodgson's liking for Tottenham's 19-year-old Dele Alli was proven with his inclusion after only three Premier League starts. Alli's Spurs team-mate Andros Townsend has often looked more at home under Hodgson for England than for his club, so expect him to be right in contention, while Manchester United's Ashley Young will also have eyes on a trip to France. Competition for places is fierce in attack but there has always been room for a "bolter" - the player who makes the last-minute surprise rush to selection for a major tournament. Sven-Goran Eriksson famously went down that route with Theo Walcott as a 17-year-old at the 2006 World Cup in Germany. The current candidates are more experienced than Walcott, and include Liverpool's Danny Ings, West Brom's Saido Berahino and Leicester City striker Jamie Vardy. Berahino has had his problems at The Hawthorns this season, including a public row with West Brom chairman Jeremy Peace after he refused to sell him to Spurs, but the 22-year-old is a real talent and could give Hodgson a choice to make if he can reproduce his best form. Ings and Vardy have impressed for their clubs this season, with the latter the Premier League's top scorer with seven goals. If the 28-year-old Leicester forward continues that form, he could yet be that shock choice to accompany the more established names. In defence I wanted to accommodate John Stones, hence his appearance at right-back. I like the idea of plenty of experience, which is why I've put Michael Carrick in there, although I was close to including Fabian Delph. I want Jack Wilshere and Jordan Henderson either side of Carrick and, with my front three as it is, there's no room for Ross Barkley unfortunately. And no Theo Walcott or Raheem Sterling? I'd be looking to use their pace as substitutes. England don't have a genuine holding midfielder but James Milner, now playing centrally at Liverpool, could screen the back four and allow the Arsenal duo of Jack Wilshere and Alex Oxlade-Chamberlain to provide energy and creativity in midfield. On current form I would opt for Theo Walcott ahead of Raheem Sterling. Pace, movement and more clinical in front of goal. For me, it's inconceivable not to start with Wayne Rooney. His form is always under scrutiny but he remains a quality player. He has shown extra responsibility since appointed captain and - as a leader as well as record goalscorer - he will play an important role. Wayne Rooney has had an exceptional career but, unless there is a significant improvement, the difficult truth is that he is no longer a striker capable of worrying the most accomplished defences. Harry Kane has also had a difficult start to the season but Rooney's form feels more like part of a decline than a mere blip. There is a slight concern, perhaps, about a lack of experience in the team without Rooney and Gary Cahill. However, John Stones is too good to leave out and Chris Smalling's improvement at Manchester United puts him ahead of Cahill. Ross Barkley will face more testing opponents than Estonia but his performance at Wembley last Friday, including one of the best through-balls I have seen for a long time, was another reminder of his rare qualities. John Stones is a fantastic prospect, but the only way he can be a starter at Euro 2016 is if he is given the chance to establish himself in central defence, ideally building up an understanding with the much-improved Chris Smalling. If not, then it will be Smalling and Cahill in central defence. Luke Shaw, Jack Wilshere and Danny Welbeck all have injury doubts over them. If Wilshere recovers, then I'd like to see him in a midfield three - but not in the deeper role that Roy Hodgson has used him in. Likewise, I'd like to see Welbeck, if fit, as a wide forward in a 4-3-3. This set-up would mean an extra body in central midfield and a better balance provided the wingers or wide forwards could be trusted to get up and down the pitch. Wayne Rooney? He stays in my team for now as he's still the most reliable goalscorer and, in this set-up, he would be helped by having speed and dynamism around him. But if Daniel Sturridge, when fit, or Harry Kane make a bigger impression between now and next summer, then Rooney will have to be the one that makes way. The controversial choice is to leave out Wayne Rooney. Although I would not necessarily have him in the starting XI, I would stress that I would still regard him as a very important member of the squad - with a big role to play from the bench at the very least. I would want to find a place for Ross Barkley, because he is a rare talent, and would encourage him to be the most forward-thinking of the three midfield players, although I would not want to totally curb the attacking instincts of Jack Wilshere and Jordan Henderson. There needs to be some fluidity to the midfield three although Wilshere needs to be the most disciplined. Welbeck might also need to fill in for Barkley.